And I have a meal plan creation problem. I LOVE to create meal plans to make your life easier. Over the past few years as we’ve shared new meal plans, you’ve told me that you need this kind of meal plan or that kind. You ask, I listen, I create new plans for you. I now have a number of different types of meal plans to help take the stress out of getting dinner on the table AND to help you spend less on groceries each week. All of the meal plans provide recipes and shopping lists and will help simplify your crazy, busy life! BUT they are all a little different and unique in their own way, each solving different problems and making your life easier in different ways. Let me explain…and you can decide which will be most useful for you! Tired of planning dinner every.single.day? Let me do all the heavy lifting for you. Each week, I’ll deliver a meal plan right into your inbox. The plan contains 6 dinner recipes, a breakfast recipe, lunch recipe, dessert recipe and usually a snack, beverage or side dish idea. Included is a shopping list, written by category with special notations for each recipe so it’s super simple to customize the list if you already have ingredients on hand, or want to skip a meal. I’m ready to save the dinner hour and bring the fun back into grocery shopping and cooking for your family! We can tell you more about the $5 Meal Plan via email, just drop your contact info below! Learn more about Erin’s new $5 Meal Plan! 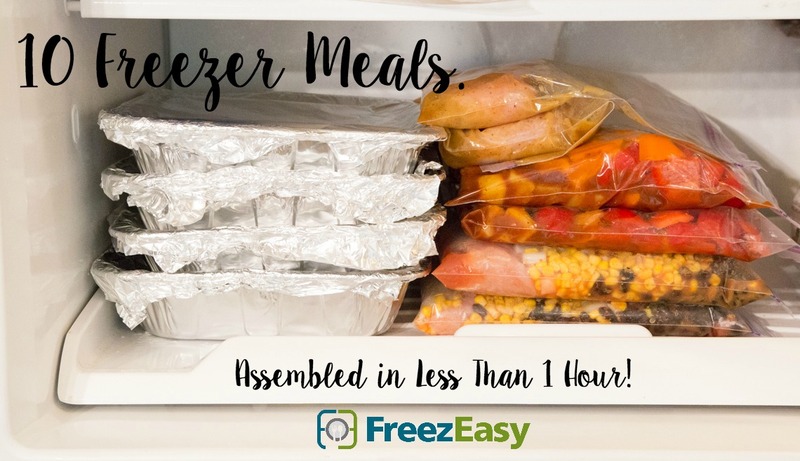 MyFreezEasy Freezer Cooking Meal Plans will help you prepare 10 delicious meals to load into your freezer in less than an hour. Step 2: Freeze your meals. Step 3: Thaw and cook. Step 4: Serve dinner without fuss or stress! Help you get organized and finally feel like you can get a delicious, wholesome dinner on the table without losing your mind! Learn more about the FreezEasy Meal Plans. These “2o meals for $150” meal plans show you how to make 20 meals using ingredients that total $150 (prices from my local Costco). I research the recipes, “mix and match” ingredients so the total cost is around $150. Then I assemble all of the meals “live on video” from my kitchen, to show you just how to do it. 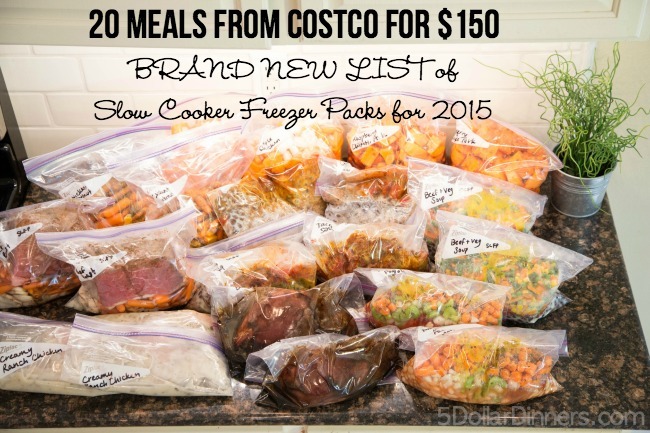 These meal plans include ingredients that were purchased at Costco for $150. Most of the plans were developed for warehouse shopping, but they can be used at any store! The most popular plans are below. You can see the complete list of plans in the series and their recipes here. You can add it to your cart below and visit the MyFreezEasy Shop to check out all the meal plan options and different recipe sets! We will continue to develop new meal plans for each of the different types described above. If you’d like to get notified of the release and special offers for any future meal plans that we release, please let me know below! Thank you for such a very thorough resource!!! On the meal plans, how many servings per recipe? 20 meals for $150 for how many people? Thanks! Generally the recipes on $5 Dinners are written for 4 servings each. What if you are pescatarian (fish and veggies only)? Do you plan to try to do any meal plans for those of us who do not eat meat, do no white flour products at all, no cheese sauces, etc.? Thank you so much for creating these plans. I just made your Costco meal plan #4. I purchased the printables for this plan, and I found some discrepancies/typos with the printables while doing the plan, so it wasn’t as smooth or as quick as anticipated. Due to their not being measurements for the produce in the recipes, I had to do a lot of cross referencing about the quantities of the produce needed for the recipes (maybe I just need to get used to it). I wasn’t sure how much lime juice to use or how much BBQ sauce to use for two of the recipes. I needed to open 9 cans of tomatoes instead of the 8 listed in the assembly instructions. I was confused by the chicken broth because the shopping list wasn’t specific about whether it was cans or boxes or broth and my Costco carried a 12 pack of cans, but not a 12 pack of boxes, so I ended up with cans by accident. I ended up opening 9 cans of broth (hope that helps if others bought cans too). I started to watch the instructional video, but I was ready to get started and didn’t watch it all the way through and thought everything I needed to know was in the assembly instructions. The assembly process would go more smoothly if the meat were rinsed and prepped first and placed into all of the labeled bags and then placed in the refrigerator before doing the produce prep. This will greatly reduce the time that the produce and meat is sitting out on the counter. All of the recipes list the meat as going in the bag first, so it is a good idea to do the meat first and store in the refrigerator until the produce is ready and then assemble the bags. I found that I had chicken left out for much longer than I would prefer due to the meat cutting step for the last two recipes being after assembling 16 bags of meals. This is my first time doing this plan, and I spent 7 hours putting this meal plan together following the step by step assembly instructions with only a 15 minute pause to make my family dinner. I was peeling and rinsing and chopping as fast as I could. I did chop carrots and slice mushrooms which added some extra time. I didn’t even have a chance to stop to eat with my family or even pour myself a glass of wine. I thought it would only take a couple hours to make the meals, so next time I will start earlier in the day. Hopefully the next time around it will be much faster. I think that by doing the meat prep first I can break up the time it takes between two days if needed so it is not so time consuming. Looking forward to seeing how the recipes taste. Thanks for sharing your experience. It helps people like me, who haven’t done anything like this before, plan accordingly. I have made Cpstco meal plans 1, 4, and 9 without any trouble. My husband and I chop and assemble together in under 2 hours. 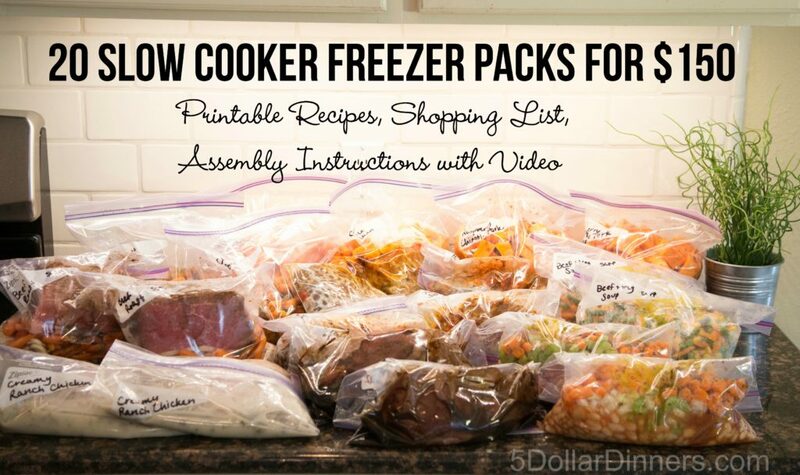 Most of the slow cooker recipes don’t require any actual pre-cooking, so I use frozen meats which i Just drop into the bag. I don’t chop the chicken ahead of time, because if will be soft enough to break up with a spoon in the crockpot after slow cooking all day. I don’t chop the baby carrots from Costco up because they are small enough already. Also, I sometimes use an electric pressure cooker when I need to get a meal cooked fast, and haven’t gotten the slow cooker started in time. It works well too. I have found that it IS worth is buy the full package with assembly instructions. My brain gets too frazzled trying to read and assemble one recipe at a time (times two bags) without it. I have just made the same meal plan. I agree that there are some discrepancies/typos in the recipes. Like you need 12 thighs not 6 and when you go to do the assembly line the prep it lists 5 onions, you need 9. I am really looking forward to trying these though. I know for the next time what to do and for the other meals plans I will read more carefully and do a “dry run” to double check quantities. Thank you for these great meal plans!!!! I just assembled Plan 6 earlier this week and loved it! I am so excited to start cooking them now for my family. I highly recommend watching the assembly video while you make them. It made it so much easier in my opinion. Thanks for these great plans! I am interested in getting the meal plans, but we have allergies in our family. How easy is it to adapt the recipes when we can’t have peanuts, tree nuts, or soy? so…..totally rocked it out last night with my daughter and new daughter in law putting these freezer packs together. It was so much fun ! They took turns reading me the directions and I followed ! It really is such a great idea. I was disappointed that our Costco did not have the raspberry chipotle sauce so, I used the cherry habenero instead. It will probably be wonderful. I watched your video first which really simplified it for me. I knew to add the chicken bouillion but the prep instructions did not have the boullion listed. Thanks for your hard work !! This is great ! ?? have fungus in my fingernails for more than a year. 1st year?? used medicine pills wh?? ch my doctor gave me.?? read and tried many natural remedies but they were all topic remedies. as we know the fungus hails from the nail root but topic treatments cannot reach there.?? still struggle desperately. I’ve been looking at your site for several weeks and love it except that almost every time I’m on, I get a pop-up that warns of a virus on the site. Today I was ready to sign up for the free meal plan offer (4 weeks) and I got the same offer. Now I’m concerned that I shouldn’t try it. Am I the only one with this problem? I’m on Google Chrome. To me, it sounds like you have gotten one of those pesky add-ons. It probably happens when you are on other sites as well. You can go to a search engine (i.e. Bing.com, Google.com) and type in: Free Virus Scan and Removal. There are several programs that you can download and that should take care of your pop-up problem. If you are unsure of the credibility of the website, you can search their name and you will get a good idea of what others are saying about the website. I am “just” a Mom and I am offering you advice that helped me. The site is fine for me. I don’t know anything about any pop up. Also if you notice in the first photo of the meals in the freezer even if you have a small freezer you can still have room for ice cream etc. With all the meals stacked in the freezer. Just a question about assembly – in the packet it says to add potatoes just before cooking, but in the videos Erin adds them to the bag with all the other ingredients… Does it make a difference?? Potatoes will turn brown and mushy if frozen and then cooked! Adding them right before cooking saves you from the ugly! i often consume frozen products because it’s useful in my daily meal, it’s such a nice program and i recommend it for everybody!! I have a make-ahead cookbook, though I have been poking around this site too! I get together with a Friend or 2 and we go through the recipes and find what we’d like to prepare. We then go shopping together, or split the shopping list up, so we are all roughly paying the same, and then we spend the day together cooking and packaging (and drinking wine) 🙂 Afterwards, we all take equal portions of what we made home. We get a lot of variety in a shorter period of time that way. Whoops. I can’t type my name! So i Paid for it, and nothing came to me? I paid a long time ago. Hi. I was under the understanding that you developed some low glycemic and low sugar recipe plans for diabetes such as myself, but when I search your site I can not find them. Can you please advise and point me in the right direction? No, I’m sorry, we do not specifically feature low sugar or low glycemic recipes. I keep trying to go to the store and my computer says it is not a safe site. Is this something you are aware of or are working on? I’m trying to purchase the Whole 30 6-week meal plan but I’m not seeing that in your options. Are the 6 week meal plans (Skimpy Calorie) also $5 per meal? Thank you! Just curious, anyone from Canada try this? Our food prices are insane so often the frugal food sites don’t work for us or include products only available in the US. Do you require base ingredients eg. Mustard or specific eg. “Krafts honey mustard sloppy joe sauce”? The American living in Canada who is naturally skeptic.